I haven’t posted for a wee while on the Sparrowhawks. To be honest it’s a quiet time of year for them and they are not the most showy of birds at the best of times. However I did catch a glimpse of one recently, my first sighting in the new year, on the 15th of January. I was walking past the Azalea Lawn and one darted over my head and landed in a conifer nearby sending pigeons scattering in all directions. 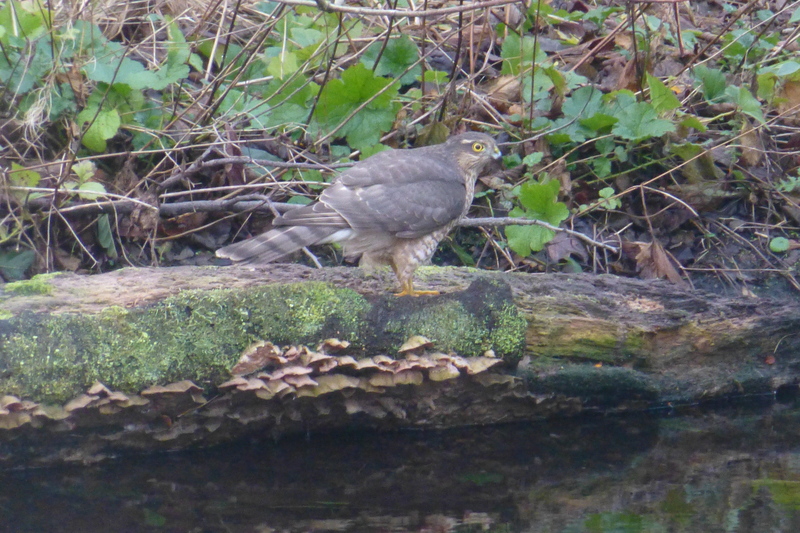 I went up to have a closer look and could see what looked to me like a large female sparrowhawk. When I say large I mean that it looked very well fed and I could understand this because there do seem to be a lot of small song birds around at the moment. As I was watching it up in the tree a hapless pigeon flew by so it took to wing and set off in pusuit. I tried to follow it but lost sight very quickly. There were also tell-tale signs of a pigeon kills left near the Biodversity Garden and in the Copse. It is also up to Mother Nature to do her thing and considering that there are now less than 5 years to 2020, how feasable is it to see major changes in species populations in this time period considering that reproduction for a lot of the species works on a annual basis. Sparrowhawk breeding pairs for instance generally have just one clutch of Eggs around the end of spring and then the chicks are hopefully fully-fledged round about the beginning of Autumn. It is worth bearing in mind that the CBD’s end goal doesn’t finish in 2020 with the Aichi targets’ deadline but continues right the way through to 2050, so it is really the foundation that is being laid right now for a continued effort right the way from 2020 to 2050 which gives a much greater scope for reproduction and population increase. Again if you have any info about Sparrowhawks in the Edinburgh area please leave a comment below or post on any of the various social media channels using #BotanicsSparrowhawks.